Congratulations Brian and thank you. If you ever decide to visit Helsinki contact me. I cannot imagine being able to negotiate all the security hurdles without your invaluable advice and guidance. Thank you for all your work. Happy Anniversary and Happy New Year. Thanks for everything, and keep up the good work! Happy 3rd Birthday! While you may think it seems like such a short time, I think of it as the reverse. Since I’ve been reading your site, it feels like a very long time since I have gotten into a real jam. Brian and his faithful readers are the greatest. And thank you, Brian, for your hard work and excellent reporting! *also disables ABP for Krebsonsecurity.com* congrats! ~ All the best for the New Year. And a big …. THANK YOU! May there be many more birthdays and happy new years in the future of this outstanding and informative blog (and in your own personal life as well, Brian)! Congratulations on your success! Keep up the great work. Three years! Wow, it seems like it was just yesterday when you were signing off from WoPo. Any chance of adding Brazil to your list of “public speaking”? Thanks for your independent reporting Brian, I have been an avid reader of your site for most of the three years and consider your reporting to be invaluable information in my continuing effort to be successful in the fight for information and financial security. I look forward to reading your reporting and will support your efforts in 2013. Happy 3rd Anniversary! Thank you Brian and please keep up the good work. It is always a pleasure to read your blog – exactly because it covers angles that nobody else does. And it is remarkable how other media pick up your posts on a regular basis. No day would be complete with KrebsOnSecurity. I can’t imagine starting the day without checking this website. Your website is one that I refer too often and have come to rely on for early warning about software updates as well as the myriad of security issues you cover in the wide, wonderful world of payments. 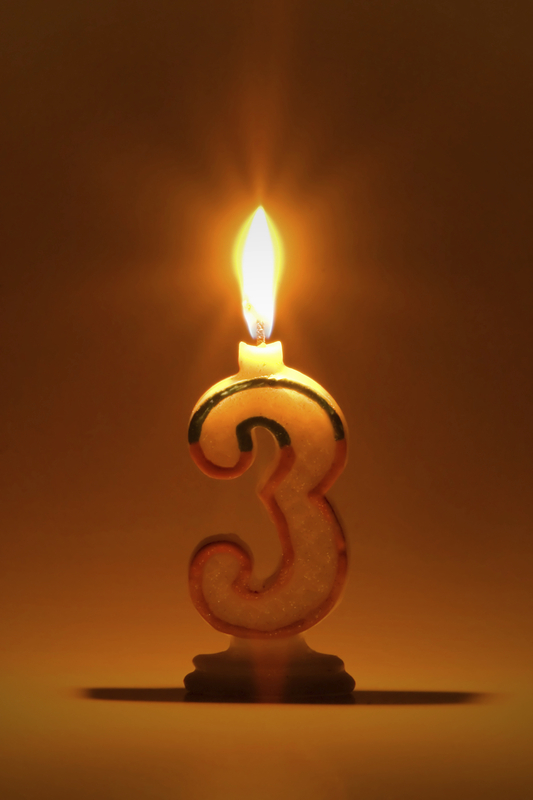 Happy third anniversary and keep up the great reporting for us all! Congratulations for another year away from wapo! Adding my thanks for your relentless quest for security, and your timely tips for all of us. I recommend your blog to all of the (alleged) IT pros I know in our company and personal contacts as well. Invaluable and essential stuff. My, how time flies! Has it already been three years since you started “Krebs on Security”? Your columns in the Washington Post caught my attention at the time, and ever since then I’ve been following your posts. Your professional advice and expertise have kept so many of us out of trouble and built up defenses against the bad guys out there in cyber space. Happy 3rd anniversary and a healthy New Year with peace for all mankind! Thank you for your persevering hard work, Brian! Like the commenter above, I also followed you from the Post. Congrats and keep up the good work. All the info is very useful for us to keep alert online. Are contributions to KrebsonSecurity.com tax-deductible in the US? hack reports would be a bit better if, when possible, to include a description of the victim system . was CFR running XP or Win7 ? why were they riunning IE8 ? because they’re still on XP ? Congratulations and Happy Anniversary! It does seem longer than just 3 years, but maybe that’s because I followed you when you were at WaPo. Thanks for all you do in this field and continued success in 2013. Congrats. Have you ever considered doing a monthly Q&A? It wouldn’t have to be a live chat; people could submit questions as blog comments. Congratulations, Brian, and thank you for the superb service that you offer. I get your RSS feed, and it’s one of the first things I check every day; more than once, you have been the first to alert me to essential security updates. I’ve been with you all three yrs. and have not been disappointed. Have a really good year.